In this Oct. 7, 2015, file photo, Maine quarterback Dan Collins looks for a receiver while teammate Jamil Demby blocks Yale's Marty Moesta Saturday at Alfond Stadium in Orono. 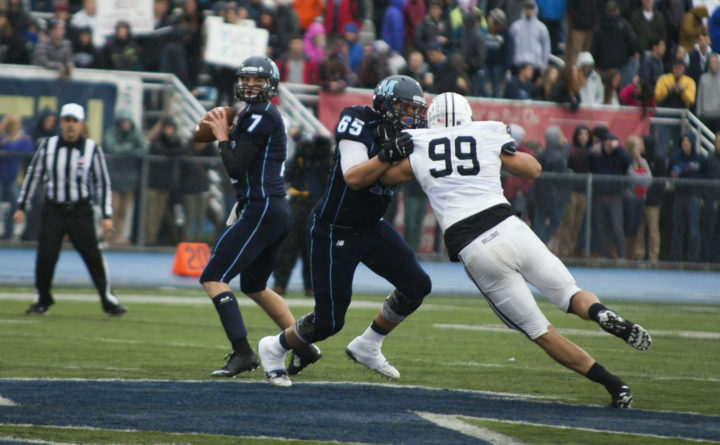 University of Maine offensive lineman Jamil Demby is a busy man these days. The 6-foot-5, 335-pound Demby played in last Saturday’s NFLPA Collegiate Bowl game at the Rose Bowl in Pasadena, California and will now play in the 69th annual Reese’s Senior Bowl on Saturday at 2:30 p.m. at Ladd-Peebles Stadium in Mobile, Alabama. The game will be televised live on the NFL Network. Demby played tackle for the triumphant National team against the American team in the Collegiate Bowl. His team won 23-0. His team was coached by former NFL head coach Mike Martz, who was the offensive coordinator for the 1999 Super Bowl champion St. Louis Rams. Demby, one of few Football Championship Subdivision players among Football Bowl Subdivision players, played most of the game due to an injury to another tackle and was pleased with his performance. In the Senior Bowl, Demby will play for the North team against the South squad. The North will be coached by Denver head coach Vance Joseph and his Broncos coaching staff while the South will be directed by Houston Texans coach Bill O’Brien and his staff. The game will feature quarterback Baker Mayfield from the University of Oklahoma, the 2017 Heisman Trophy Award winner that goes to the nation’s top player; Biletnikoff Award winner (top receiver) James Washington of Oklahoma State and four players from national champion Alabama: cornerback Levi Wallace, defensive end Da’Shawn Hand, center Bradley Bozeman and punter J.K. Scott. Demby, who is already in Mobile, said the NFLPA (National Football League’s Player Association) has done a “good job replicating a week of NFL football. It’s nice to be in that atmosphere. “It’s definitely a sweet feeling and an honor to be with these guys and finally being able to prove I belong in this kind of atmosphere even though I’m from a small school. (Being from an FCS school) has motivated me,” said Demby who added that he felt he was well-prepared thanks to his four years at UMaine. “Every day is like game day at UMaine and that helped me last week and helped me get the invite. I feel like my game improved last week and, mentally, I feel like I belong here. I’ve got to go out and continue to show it,” said Demby who is hoping to be drafted by an NFL team this spring. Practices will be televised live by the NFL Network on Tuesday, Wednesday and Thursday and by ESPN and ESPNU on Wednesday and Thursday. There also be hour-long recap shows on the NFL Network each night. Demby had an impressive career at UMaine, appearing in 42 games and earning All-Colonial Association first team and Phil Steele FCS All-America first team honors this season. He was an important cog on UMaine’s offensive line that allowed a league-low 19 sacks this past season. The Vineland, New Jersey, native was also a STATS second team All-American and an All-New England choice. He was a third team All-CAA choice a year ago.